From 2008, TOUCAN is still with her first owner and she is his third Nautor’s Swan. To iconic designs from German Frers, she encapsulates the essence of the Swan brand and why for many people, they are quite simply, the finest yachts on the planet. 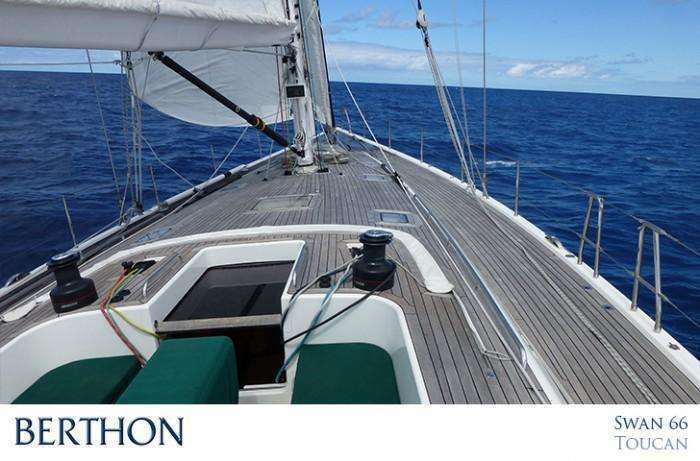 For their owners, the ownership of a Swan delivers a powerful, safe and rewarding sailing yacht that can cross oceans with ease and in comfort, can be sailed with family and friends and are forgiving and fun to be aboard. Once you have reached your destination, some tweaking can also have her in the chocolates on the Regatta circuit. The term cruiser racer is much overused and seldom delivered – but the Swan 66 manages it perfectly. It is said that the secret of a successful yacht is the one whose crew always want to come back tomorrow – enter TOUCAN…. 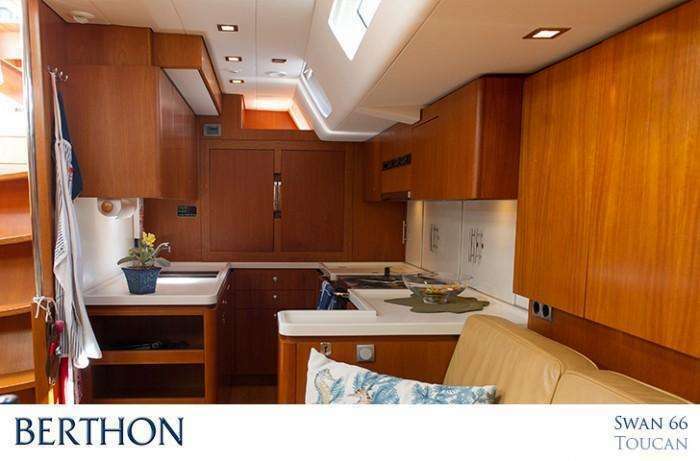 Equipped for serious mile munching, and for use by family and friends, she has proved herself to be an excellent long distance sailing yacht. 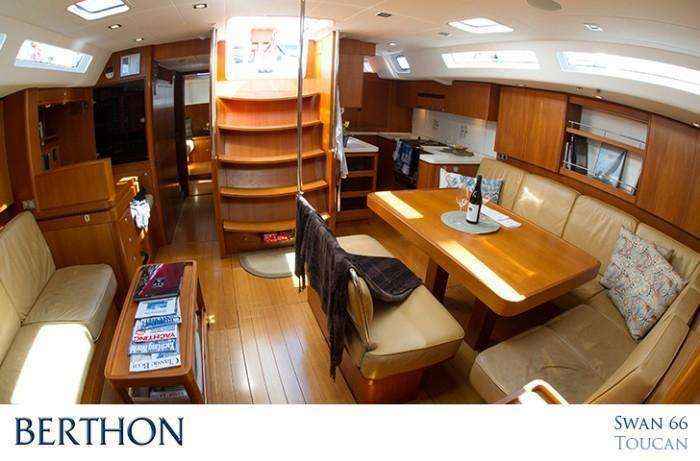 Her owner picked her up in Pietasaari and sailed her back to Berthon in 2008, before cruising her extensively in Scottish and Northern European waters. From there she headed across the Atlantic and since then has based on the East Coast of the USA with winters spent cruising the Caribbean and the summers on the fabulous East Coast including passages to Nova Scotia and Newfoundland. She is now laid up at Newport Boat Works in Newport, Rhode Island, a hop and a skip away from our Berthon office in Newport and will be ready to be awakened next year by her new owner for new adventures. In the meantime she is available for inspection whenever suits you. 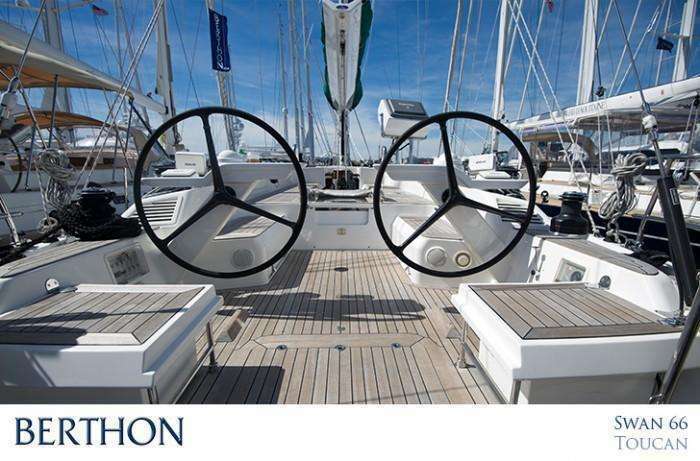 Jennifer Stewart from Berthon USA is very much a Swan officianado, having been the Nautor Swan Agent for the East Coast of the USA for 12 years, and our office there is used to selling multiple brokerage Swans annually. 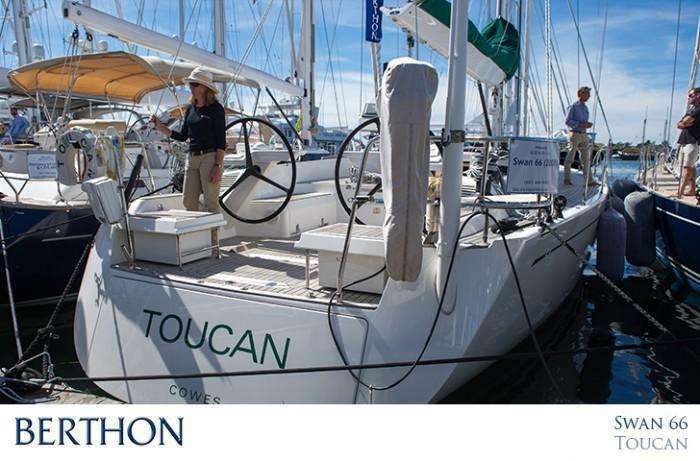 TOUCAN has been skipper maintained from the beginning and has enjoyed a punishing maintenance schedule through life. She comes with spares for her spares and every possible widget required for long distance sailing. She is large enough to accommodate 9 souls, yet can be sailed comfortably with 2 without fuss. Her joinery is classic Nautor honey teak which is all in good shape and her green style lines are a nod to the green billed Toucan from whom she takes her name. 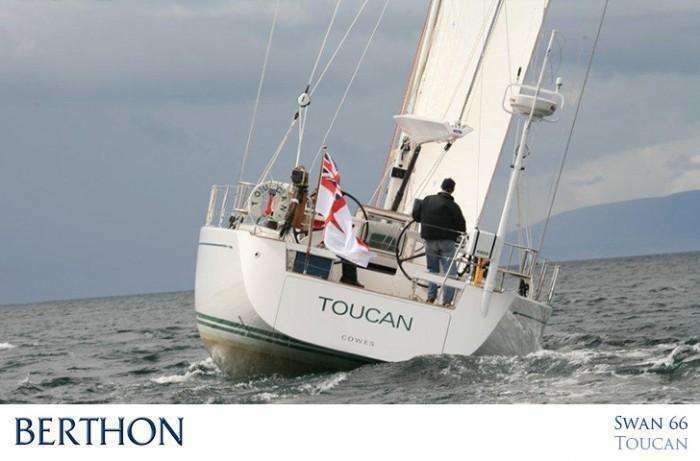 For a new owner, TOUCAN is perfectly situated to take part in the 2015 Transatlantic Race from Newport, Rhode Island to the South Coast of the UK which leaves the East Coast in June of next year. Arranged by the New York Yacht Club, Royal Yacht Squadron, Royal Ocean Racing Club and the Storm Trysail Club, the event coincides with the Royal Yacht Squadron’s 200th anniversary celebration. It will be a great event. 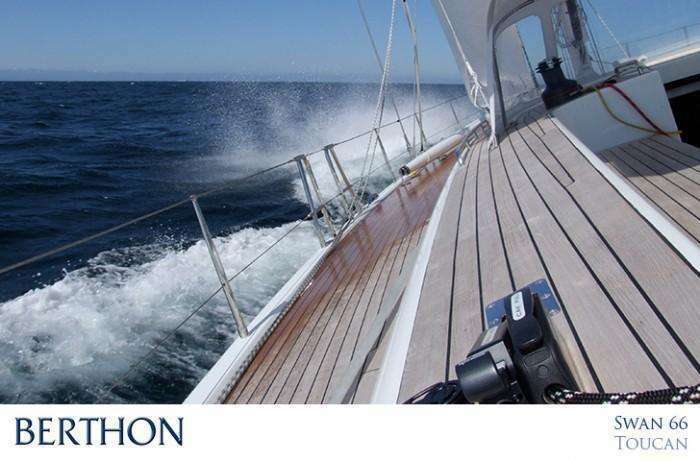 A new owner could take advantage of this once in a life time opportunity to sail with TOUCAN on this epic and great fun adventure, arriving in the Solent at the height of the summer, however, we cannot guarantee the weather! 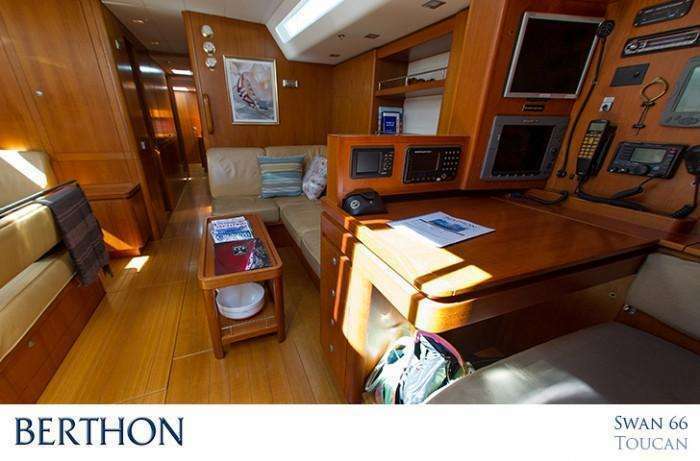 Her current owner would be happy to help with the logistics for this event to ensure that she were crewed and prepared to ensure that her new owner enjoyed the passage to the max.